Heading to GrrCON 2017 in Grand Rapids? Be sure to stop by booth # 18 to see Vista IT Group, where we will be handing out some awesome swag and candy! While you are there, make sure you enter our drawing for a chance to win a CanaKit Raspberry Pi 3 Complete Starter Kit – 32GB Edition. GrrCON is an info security hacking conference in the Midwest that draws over 1,500 attendees with various backgrounds including students, security researchers, industry professionals, hackers, and more. We will be there showcasing our unique offering from Cisco, a giant in the technology security sector. Vista’s unique relationship with Cisco Systems qualifies us to resell Cisco products that are considered excess to Cisco’s supply chain. The benefit is that Vista’s customers can purchase products that have gone through Cisco’s exhaustive remanufacturing process, are licensed with a valid IOS, and are guaranteed by Cisco to be SMARTnet eligible. Because Vista is one of only a handful of companies with this unique relationship, we are able to significantly reduce capital expenditures. This exclusive program provides our customers with the confidence that Vista will deliver certified, seamless, and SMARTnet eligible refurbished Cisco solutions that fit both strategic and budgetary requirements. 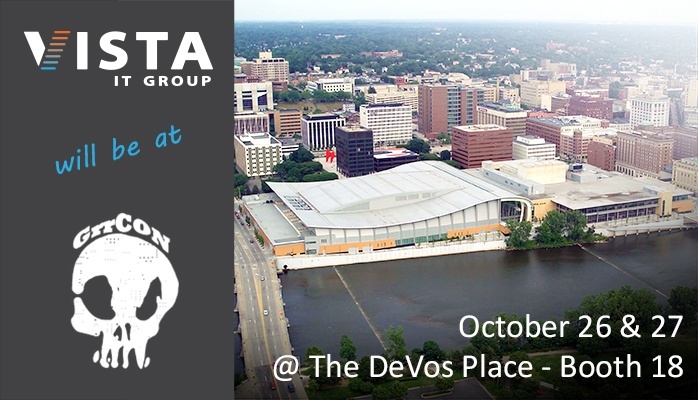 The GrrCON Cyber Security Summit & Hacker Conference will take place at DeVos Place, in our home city of Grand Rapids, MI. This two-day conference will be held October 26 & 27, 2017. Haven't registered? There's still time!